I've worn James Jeans for years before discovering Uniqlo denim which cost a fraction of their American counterpart. I've made my fair share of mistakes when buying denim. In fact, I've tried on most brands but I keep coming back to these James Jeans and Uniqlo. Why fix something if it ain't broken? After countless trial and error, I find that the mid to high rise jeans seem to suit my apple figure the best. This Twiggy model by James Jeans has been around for years. I'm not one for tight skinny jeans as I'm not tall nor have legs up to my armpits but these are amazingly soft, comfortable and stretchy. Funnily enough, they make my legs look a million miles long with a nice lift to the bum. There's no evidence of my usual muffin top and they tuck into my riding boots beautifully without additional fabric bunching on the kneecap. 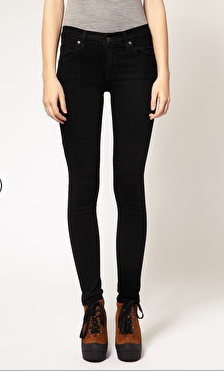 I'm loving my new high rise Twiggy skinny jeans and have been wearing them non stop for the past couple of weeks. I refuse to pay retail unless I absolutely have to. These cost £85 and are discounted by 50% at Asos. I managed to nab an additional 10% discount code so the total came up to £76.50. Finding well fitting jeans is a battle so I am glad you came a cross a brand that fits you well! And the price seems reasonable so that's always a bonus!!! wow the model's legs are seriously...twiggy lol. glad u were able to finally find well fitting jeans! i seriously hate jean shopping more than anything. nothing ever fits. always have to get them altered, which means i always have to wait a few days before i can wear them. Those are cute! I have a hard time finding skinny jeans I like because I can't stand a low rise fit and it seems like most of them are low rise. I prefer a mid rise. hey!! This is a great post! I'm glad you wrote a review on them because honestly, I have short legs too and have been wanting a pair of skinnies lately - and hesitated to buy the james jeans ones for the high retail price. now, i know it's worth trying! =) and the discount is a plus! Thanks, a bunch! Bessie, you would faint if you ever saw the insane price tags of American denim here in the UK. ShinyPrettyThings, LOL, you're right. The model's legs are insanely thin. I detest shopping for jeans. I hate the dark and small fitting rooms or the friendly SA who keeps bring more and more while I feel worse and worse because NOTHING fits properly. LV, I completely understand you. I can't do low rise. I don't get why these companies keep making more low rise jeans as they just don't look good on normal sized women. Sam, they're American and are absolutely fantastic. Their jeans fit amazingly well. I tend to go back to Uniqlo because they either alter for free on the day or charge a minimal £3 for the job. Mia, I've managed to nab a few pairs of James Jeans from eBay in the past for really low prices. I hold it in! 34 27 34, you can imagine how big my middle was when I 45lbs heavier - my hips almost stayed the same! Hey M. (i don't know if people know your name) No worries =) I figured you're busy! I actually forgot until you just mentioned it. =P I'll keep an eye out on ebay until then! So I went on ASOS and just realized that you were talking in £ and I thought it was $ (silly me!) and that the prices are $300 a pair!! T.T Is it specifically for that pair? or are they all $300 a pop? They are somewhere mid 100's to high 100's here in the US. Ahhhh, finding the RIGHT jeans! What a job it is!!! I walk into the dressing rooms with stacks. HAHAHA If it's not the middle, then it's the hips. If it's not the hips, then it's the length. Then you find the right fit and they don't have the dayuum shade you want in YOUR size! Love this post and glad you found something that works girl.